Thank you for writing. Few challenges are more urgent than climate change, and I appreciate your perspective. For the sake of our children and our future, we must do more to combat climate change. Its effects, including warmer temperatures, extreme weather, and sea level rise, are already being felt across our Nation and around the world. The 12 hottest years on record have all come in the last 15. Heat waves, droughts, wildfires, and floods are all increasingly frequent and intense. We can choose to believe that these disasters are the result of coincidence, or we can accept the overwhelming judgment of science and act before it is too late. Our planet’s future depends on a global commitment to permanently reduce the greenhouse gas pollution causing climate change. 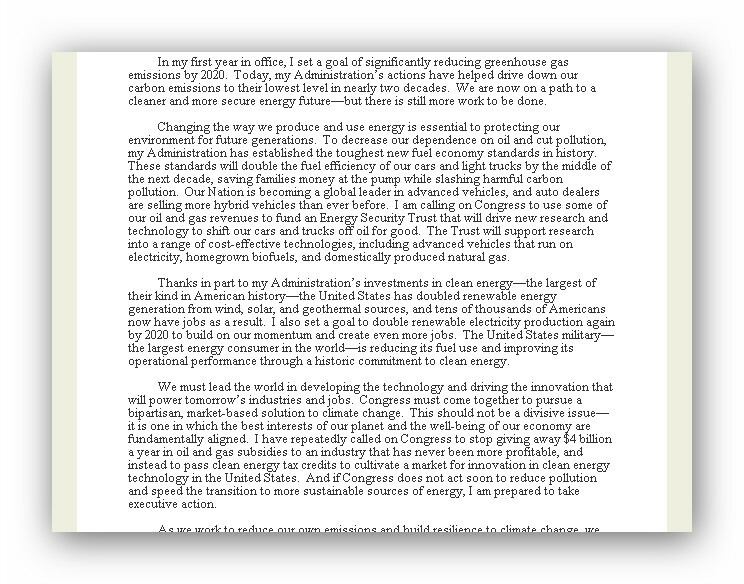 In my first year in office, I set a goal of significantly reducing greenhouse gas emissions by 2020. Today, my Administration’s actions have helped drive down our carbon emissions to their lowest level in nearly two decades. We are now on a path to a cleaner and more secure energy future—but there is still more work to be done. Changing the way we produce and use energy is essential to protecting our environment for future generations. To decrease our dependence on oil and cut pollution, my Administration has established the toughest new fuel economy standards in history. These standards will double the fuel efficiency of our cars and light trucks by the middle of the next decade, saving families money at the pump while slashing harmful carbon pollution. Our Nation is becoming a global leader in advanced vehicles, and auto dealers are selling more hybrid vehicles than ever before. I am calling on Congress to use some of our oil and gas revenues to fund an Energy Security Trust that will drive new research and technology to shift our cars and trucks off oil for good. The Trust will support research into a range of cost-effective technologies, including advanced vehicles that run on electricity, homegrown biofuels, and domestically produced natural gas. Thanks in part to my Administration’s investments in clean energy—the largest of their kind in American history—the United States has doubled renewable energy generation from wind, solar, and geothermal sources, and tens of thousands of Americans now have jobs as a result. I also set a goal to double renewable electricity production again by 2020 to build on our momentum and create even more jobs. The United States military—the largest energy consumer in the world—is reducing its fuel use and improving its operational performance through a historic commitment to clean energy. We must lead the world in developing the technology and driving the innovation that will power tomorrow’s industries and jobs. Congress must come together to pursue a bipartisan, market-based solution to climate change. This should not be a divisive issue—it is one in which the best interests of our planet and the well-being of our economy are fundamentally aligned. I have repeatedly called on Congress to stop giving away $4 billion a year in oil and gas subsidies to an industry that has never been more profitable, and instead to pass clean energy tax credits to cultivate a market for innovation in clean energy technology in the United States. And if Congress does not act soon to reduce pollution and speed the transition to more sustainable sources of energy, I am prepared to take executive action. As we work to reduce our own emissions and build resilience to climate change, we must also forge solutions that ensure other countries do the same. My Administration led international climate negotiations that produced the first national greenhouse gas reduction commitments by major developed and developing countries, the most robust transparency system for reviewing commitments to date, and historic global climate resiliency efforts. At the same time, we have worked through a range of international initiatives, including through the G-20, for the global phase-out of inefficient fossil fuel subsidies around the world. The threat posed by climate change is not confined within the borders of any country, and our response must continue to be global. Finally, we must take action to prepare our communities for the consequences of climate change. Through the Climate Change Adaptation Task Force launched by my Administration in 2009, Federal agencies have developed first-ever initiatives to ensure our communities, economy, infrastructure, and natural resources are resilient in the face of extreme weather and other impacts of climate change. We are also helping increase the preparedness and resilience of American communities by providing actionable scientific information and technical assistance to cities and towns that are already feeling the impacts of rising seas, more severe storms, and other effects of climate change. We must summon the spirit of optimism and the willingness to tackle tough problems that led previous generations to meet the challenges of their times. 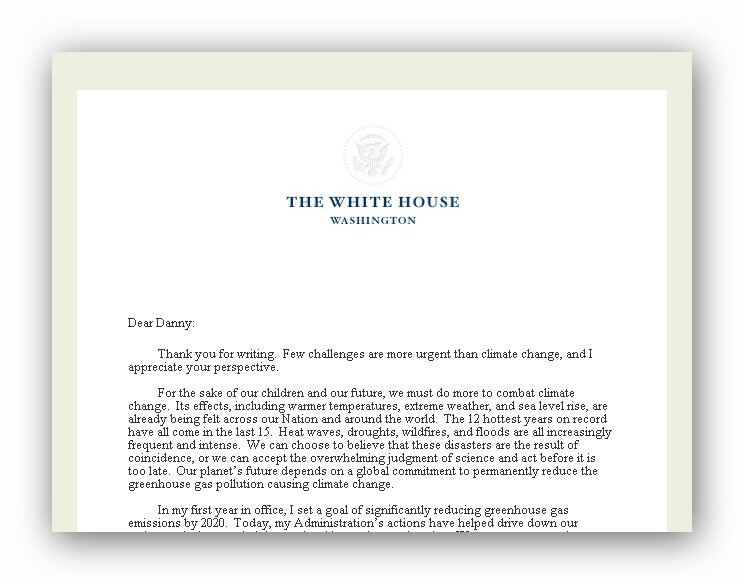 My Administration is making a serious, sustained commitment to address climate change, and I encourage you to learn more about our efforts atwww.WhiteHouse.gov/energy/climate-change. 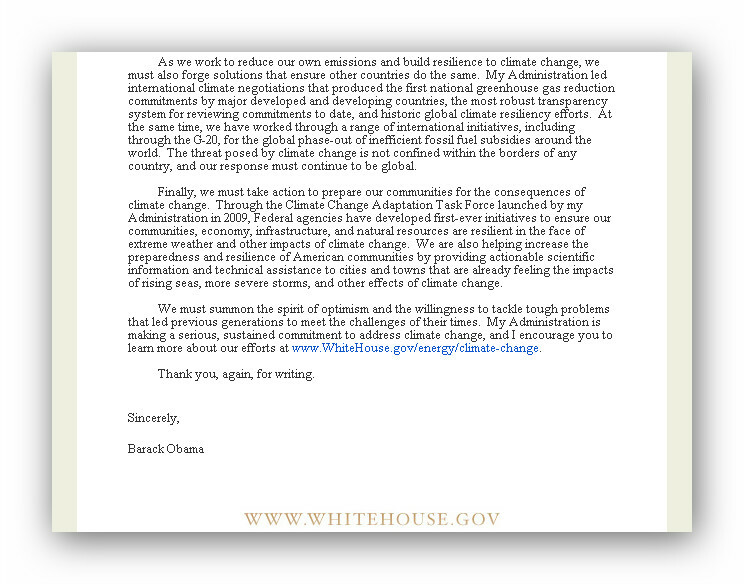 A letter to barrackobama.com, organizing for action and President Barack Obama about immigration, the right to bear arms, and climate change. I believe that immigration, capitalism and free markets, and civil rights were the key to the United States economic success. I believe that rage shooting factors should play a part in prevention similar to suicide factors play a part in suicide prevention, and believe that the right to bear arms and freedom of speech should not be weakened since they are central in protecting our rights and freedoms. I also know that similar to the workplace strategy of using participating employees to create justification to take action there are forces that move through organized crime that try to create justification to weaken both of these central civil rights, which are linked to subjugation through organized crime. I also believe that climate change should be on the United States top threats to national security given its link to mass extinction. The increased volcanic activity due to climate change, the melting ice that reflects energy back into space, deforestation that eats the suns energy before it reaches the earth, the increase in green house gas, CO2 levels, floods that increase CO2 levels, the acidification of the oceans due to CO2 and %30-%40 decline in plankton that also eats energy and produce oxygen, are all linked to increased volcanic activity, eruptions, more CO2 and gases, ash linked global starvation and ice age, and mass extinction pattern or "doomsday volcanoes". The PBS videos on the page give a good indication of the danger, mention Yellowstone park, and several other volcanoes that have increased in activity such as Katla. I'd like to mention that Alaska and Mexico have increased in activity, which are part of a chain of mountains that run up the United States and several other volcanoes. Canada's tar sands and Peru's deforestation for oil production are mentioned as political issues along with tweets from President Barack Obama. The U.S. is faced with hurricanes on the right, tornadoes in the middle, and deadly volcanoes on the left. I see improving building technology for climate change, ocean colonization, and the colonization of the moon and mars linked. Trees, vegetation, phytoplankton, all eat energy from the sun, ice reflects it back, what reaches earth heats its core, volcanic activity. New Jersey and New York may experience a similar hurricane this Oct-Nov, more record temperatures and wild fires, solar flares peek in 2013. Iceland's Laki sent toxic sulfur around the hemisphere, Hekla could unleash millions of tons of ash without warning, Katla could be both. PBS videos about volcanic activity and volcanoes give a good understanding of the danger linked to mass extinction. U.S. is now faced with hurricanes on the right, tornadoes in the middle, and deadly volcanoes on the left. New article mentions the sun's energy linked to climate change and increased volcanic activity "electron-reaction"